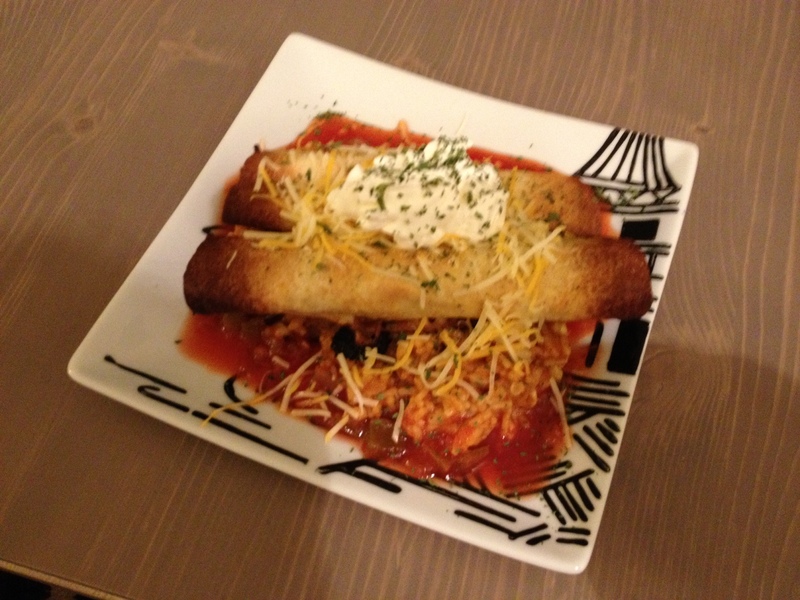 My boyfriend, Tom, has an unequaled love for taquitos. 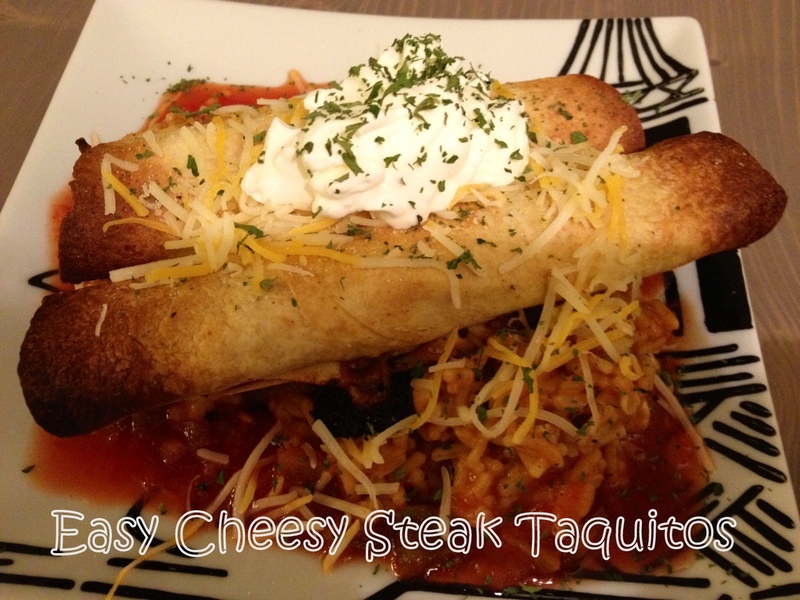 If he had to eat one meal for the rest of his life, taquitos would happily be on his menu. Unfortunately, the frozen variety are fried and filled with preservatives and all sorts of junk. While frozen are super quick and easy, homemade are actually almost as quick and easy but so much better for you and even better tasting. This is also a super kid-friendly meal so you can get your little helpers in the kitchen. My favorite thing about this meal is that you can use up leftovers to make them by substituting out the meat and veggies for practically anything you have that you need to use up. Preheat oven to 375°F. Spray a large baking sheet with cooking spray. In a medium sauté pan, add olive oil and cook onion for 1-2 minutes on medium high heat. 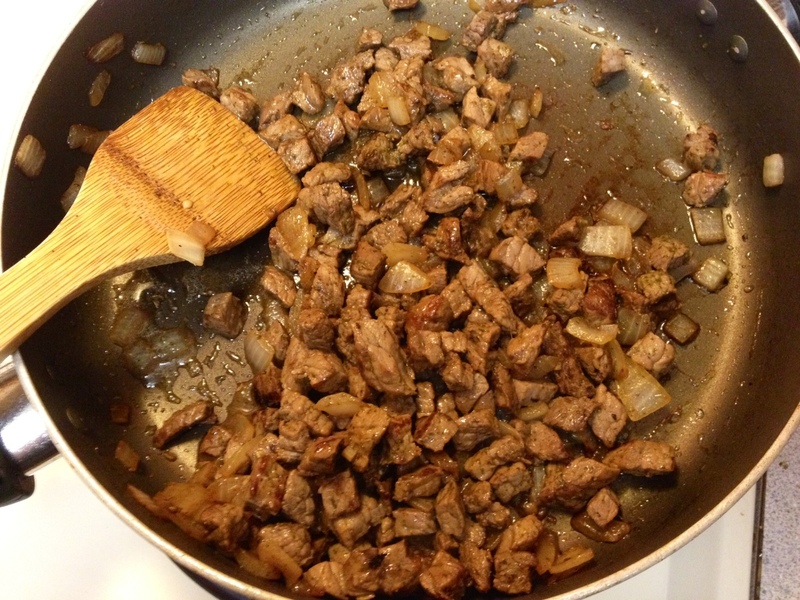 Add chopped steak and cook until no longer pink in the center. Remove from heat and allow to cool while you work on the rest of the filling. 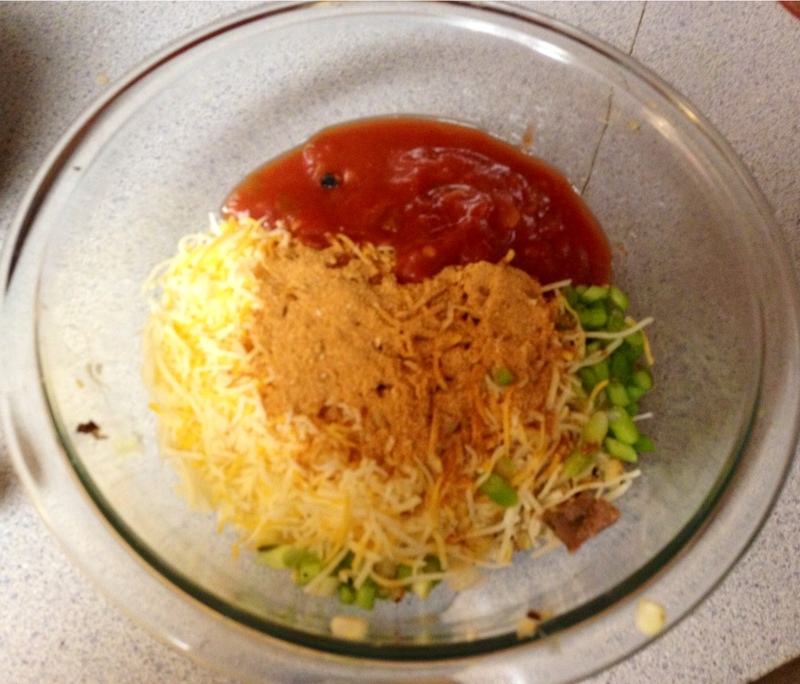 In a small bowl, mix corn, cheese, green onion, salsa, and taco seasoning until well blended. 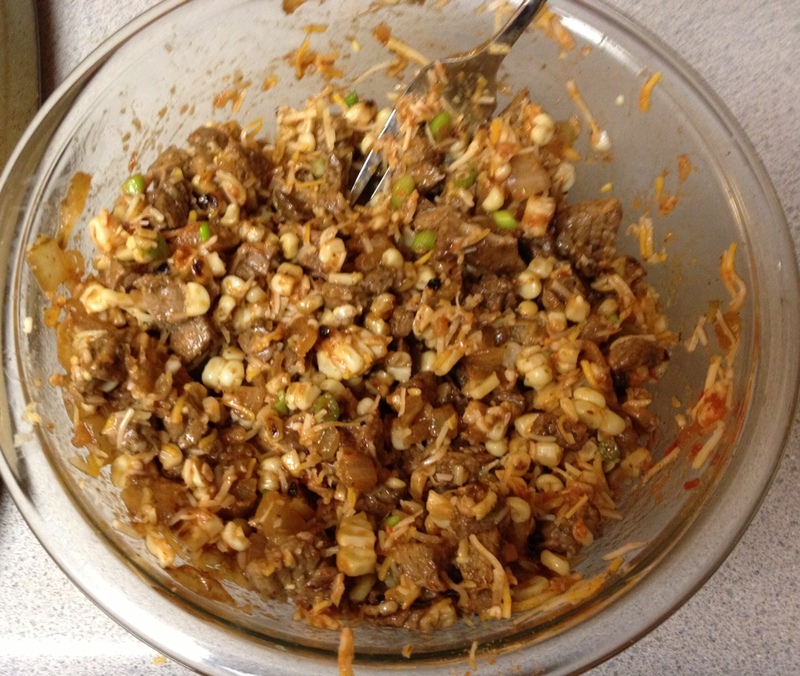 Mix in the cooled onion and steak mixture. To ensure your tortillas are nice and pliable for rolling, wrap the tortillas in a couple damp paper towels and microwave on a plate for 30-45 seconds. This is also a great tip for taco and fajita night! 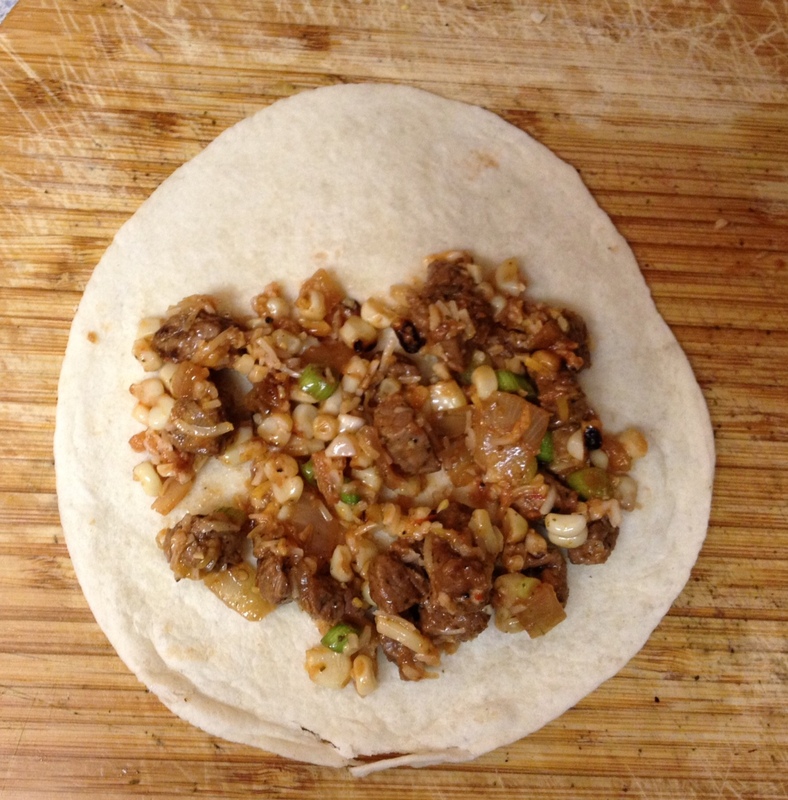 Working on a cutting board, lay out a tortilla and spread 3 heaping tablespoons of filling all over the tortilla. Roll up tightly, from bottom to top and fasten the seams with a toothpick. Continue rolling up the rest of the tortillas and then place on the baking sheet, about an inch apart. Spray the tops of the taquitos with olive oil cooking spray and bake for 15 minutes, or until brown and nice and crispy. Remove from baking sheet and cool for 5 minutes. Don’t forget to remove the toothpicks before serving! I serve with a side of Spanish Rice and little bowls of sour cream, salsa, or guacamole so guests can pick their favorite condiment. This will definitely be a huge hit and is also a great recipe idea for game day nibbles.